A few hours before the Oct. 4 press conference at which he was introduced as the fourth archbishop of Anchorage, Alaska, Archbishop-elect Paul D. Etienne reflected on this major change in his life in an e-mail interview with The Criterion. A native of Tell City, Archbishop-elect Etienne was ordained a priest of the Archdiocese of Indianapolis in 1992. 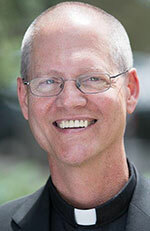 He was serving as pastor of St. Paul Parish in Tell City when he was appointed bishop of Cheyenne, Wyo., in 2009. He learned that Pope Francis had appointed him archbishop of Anchorage on Sept. 24 when he received a phone call from the apostolic nunciature in Washington, which serves as the Vatican’s embassy in the United States. “It was only in hindsight that I realized part of the grace God provided was to have two days with nothing on my calendar so I could pray and reflect,” Archbishop-elect Etienne said. While he could pray about his appointment, he could not speak about it because of the requirements of papal appointments of bishops. One of those challenges will be leading a Church almost at the metaphorical edge of the Earth. “About two weeks ago, before I received this news of becoming the new archbishop of Anchorage, I told my pastoral leaders [in the Cheyenne Diocese] that there is not one part of this Earth that is not under the pastoral care of some bishop,” Archbishop-elect Etienne said. “Little did I know that I would be soon sent to one of the peripheries of the Church in the United States. Archbishop-elect Etienne has served for seven years as shepherd of the Cheyenne Diocese, which is spread over nearly 100,000 square miles of the Rocky and Teton mountains and the high plains. Now he is looking forward to leading the Archdiocese of Anchorage, which encompasses more than 138,000 square miles, reaching north into Alaska’s interior and west into the Aleutian Islands in the middle of the Pacific Ocean. “I have thought often of our own Bishop Simon Bruté and his work as a missionary bishop, founding the Diocese of Vincennes, the future Archdiocese of Indianapolis,” Archbishop-elect Etienne said. “I also think often of the Jesuit priest, Father Pierre DeSmet, who is credited with celebrating the first Mass in the Rocky Mountain West in 1840. DeSmet and Bruté would have been contemporaries, and I often wonder if their paths ever crossed before Bruté’s death in 1839.